CONTEST DEADLINE EXTENDED TO SUNDAY, MARCH 31!! Photo and Poetry Competition Celebrates Healthy Community, Healthy Self! The Earth Day Poetry & Photo Contests are open NOW until Sunday, March 31, 2019. 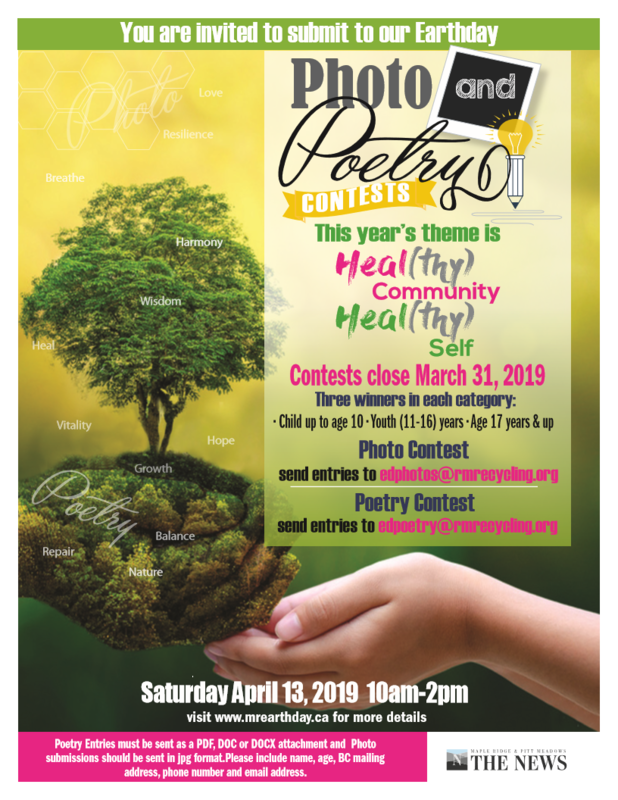 Submit your poem or photos on this year’s Healthy Community, Healthy Self theme for your chance to win great prizes and be featured in the Maple Ridge Pitt Meadows NEWS. Select winners will be invited to share their work at the Celebrate Earth Day event at Memorial Peace Park on Saturday, April 13. Ridge Meadows Recycling Society will also present a screening of “The Lorax” (with popcorn & snacks!) to the class with the most contest entries. Please list school & teacher’s name/Division # with entry. PHOTO Contest: 3 categories – Child (up to age 10), Youth (11-16), & Adult (17+), PLUS Grand Prize Winner. Send entries in jpg format (minimum 1MB) with name & age (if under 17) to edphotos@rmrecycling.org by March 31. Photo contest entries will be posted on the Celebrate Earth Day Facebook page and voting will be open to the public until Friday, April 5. Visit & vote for your favourite photos! POETRY Contest: 3 categories – Child (up to age 10), Youth (11-16), & Adult (17+). Email poems to edpoetry@rmrecycling.org by Sunday, March 31. The contest is open to all British Columbia residents. Limit up to 2 entries per person. Must be previously unpublished work. All styles of poetry will be accepted but must adhere to 350 word limit. Entries must be sent as a PDF, DOC or DOCX attachment and include name, age, BC mailing address, phone number and email address. Winners will be selected by publishing and writing professional(s). Rights: By entering the contest you are giving Celebrate Earth Day Maple Ridge first Canadian rights for publication, AND the option to collect all the years’ poems into a multi-year compilation at some point. You are free to market your poem(s) in other places, but you should inform them if it has won or appeared on the Celebrate Earth Day in Maple Ridge website or been published as part of Earth Day materials. Follow the Celebrate Earth Day in Maple Ridge Facebook page at facebook.com/mapleridgeearthday or the Twitter feed at @mrearthday for updates.